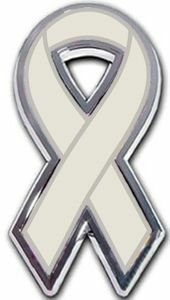 Brain Tumor Ribbon Chrome Emblem: The classy alternative to magnetic ribbons. Size: 1.625" x 3" x .125" -True chrome-plated metal finish; shiny chrome finish guaranteed to last lifetime of vehicle; Decal within chrome frame is laminated with an 1/8" thick PVC made to withstand any outdoor conditions (guaranteed not to fade or bleed unlike cheap imitations). Attaches via a paint-safe 3M adhesive foam tape. Packaged in retail poly-bags. Patent Pending. Measures 1.625" by 3" by .125". Check out our full selection of Brain Tumor Awareness Products!